Richard Fellers and STEELBI Take Home the Blue in the First Leg of the World Cup Qualifier! Vanderveen Wins Blue in the $40,200 Desert Classic FEI CSI3*-W! 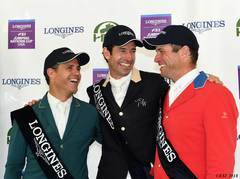 All Blues for Nayel Nassar and LORDAN in the $100,000 Longines FEI Jumping World Cup Qualifier! National Sunshine I is a Wrap! More Blues for Ashlee Bond at National Sunshine I! Bond Captures First and Second in the $40,200 Coachella Classic FEI CSI3*! Nassar Kicks Off the Week with a Win in the $35,000 Coachella Welcome Stake FEI CSI3*!